After we toured Philadelphia for a couple days, we headed to our next stop, the Big Apple! Steve and I never saw an apple there, big or otherwise, so we are not sure why it is called that. 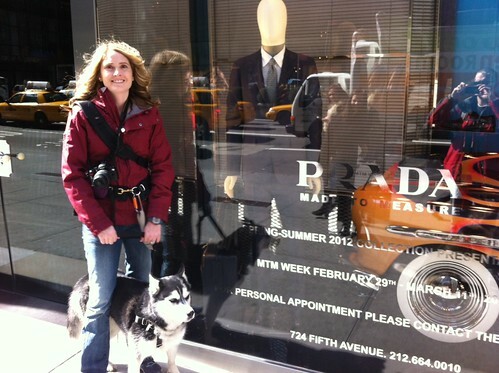 After we parked the 4Runner (which was a crazy experience in itself), we headed up 5th Avenue to Central Park. Mom wanted to stop at the American Girl store, but I said I wasn't interested in a tea party, so we went on past. Aunt Kari wanted me to get her a handbag at Prada, but I hadn't saved up enough of my allowance to afford it. 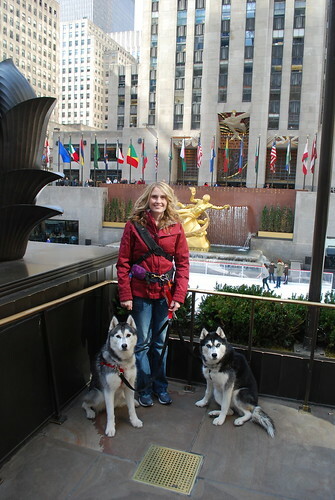 We also stopped by Rockefeller Center. I thought it would be pretty fun to go ice skating, but no one was really skating and Mom wasn't interested, so we just posed for a picture. We got stopped several times by people who wanted to admire us. Steve and I were not very interested in being admired because there was just so much going on! Finally we made it to the park. 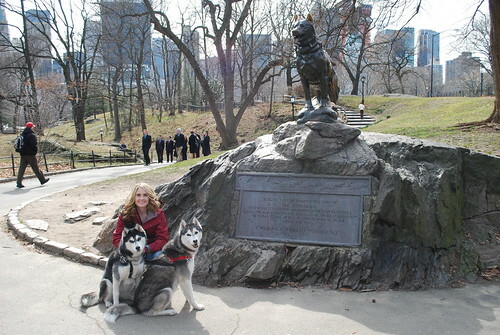 Our first stop was the statue of Balto. 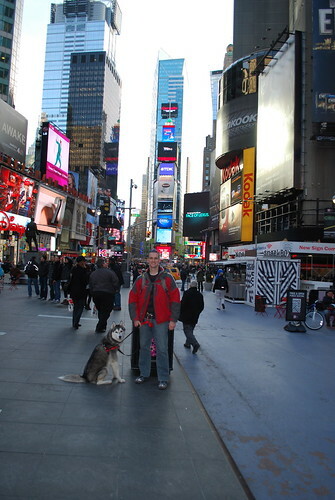 No Siberian can go to New York City and not pay a visit to Balto! After the picture, we found a nice spot in view of the statue where Mom and Dad ate their picnic lunch of peanut butter sandwiches. Mom gave Steve and me some rawhide donuts, but we were too excited to eat them. 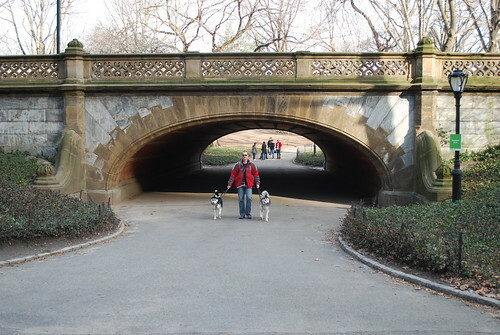 Did you know that there are horses in Central Park? I was on high alert for any horse sightings and could not settle down to eat a donut. We walked several miles in the park. It was really nice and a good place for two Siberians to burn off some energy. Next we headed down Broadway. 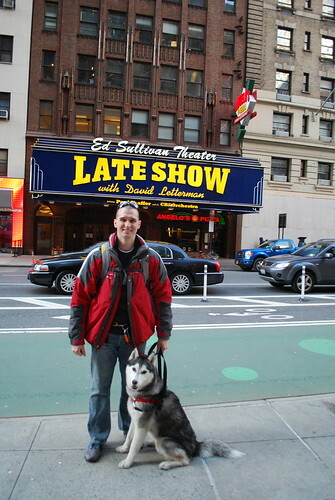 We saw the Late Night with David Letterman studio. 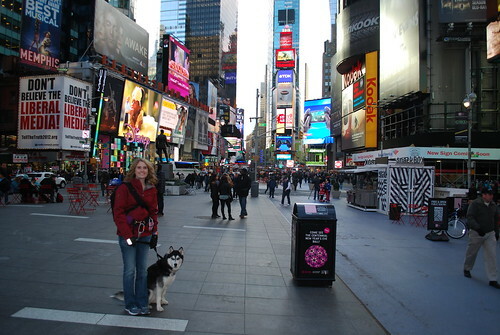 Mom went to a taping of that show when she visited NYC several years ago. Also our buddy Indy was on that show once! So of course we had to take a picture. Next we hit Times Square. Mom and Dad lost count of how many people took our picture. There were people in costumes, like Mickey Mouse, taking pictures with people for tips. Dad thought we should go back and Steve and I could wear tip vests to pay for our vacation! Our total mileage for our first day in NYC was 7.2 miles. The vacation was turning out to be a Siberian's dream with lots of exploring!